I am having such a fun weekend. On Friday night I went to my great aunt's (tante's) book launch. It was nice to sit around in the bookstore and listen to everyone speaking Deutsch. Her name is Waltraude Stehwien and she does the old German art of 'Scherenschnitt' or black & white silhouette paper cutting with GREAT detail. Her book is In Black and White: A Stroll Through Canadian Landscapes. I am so proud of her! You can read more about it HERE. That was the same night that 'Little Gems' opened which I chose to pass up for the book store. Saturday morning, my youngest and I headed out to the annual Saskatoon Spinners & Weavers guild sale. Ooooooh ... heaven! We had so much fun. 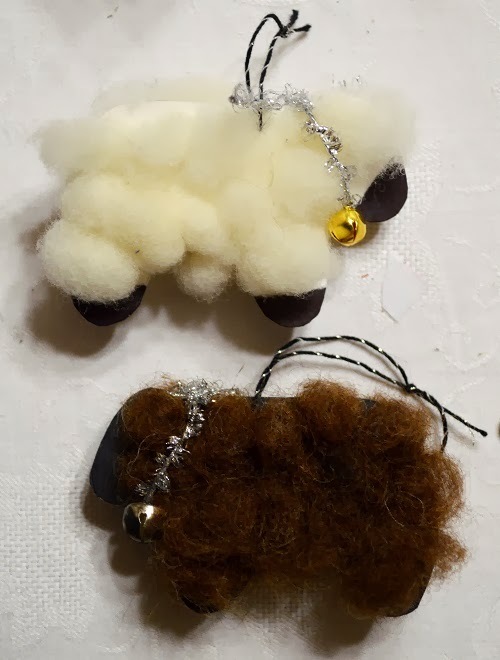 My daughter made these at the craft table.
! Adorable!! Then as I shopped she headed to the next table to create these little weavings. They told her they were 'god's eyes' but she misunderstood and presented them to me as 'goddess eyes' (which is equally awesome). 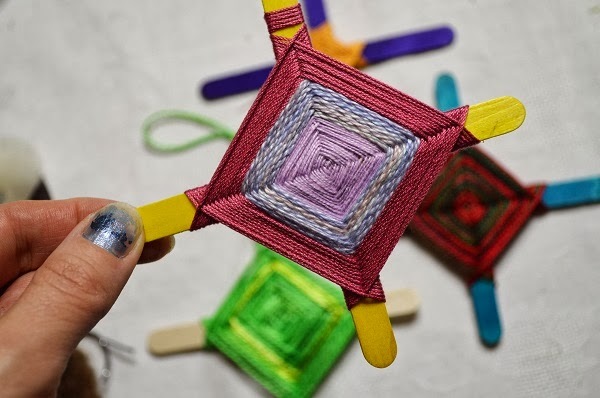 Later at home, she took out her popsicle sticks and showed me how to make them. VERY fun. With the exception that we suddenly became very hungry, we would have stayed all day. Women were spinning on such gorgeous spinning wheels. Some were weaving on floor looms, some on inkle looms. sigh. : ) And the scarves and cloths and bags and shawls around the room were incredible. ...spoiled myself. No more presents for me. 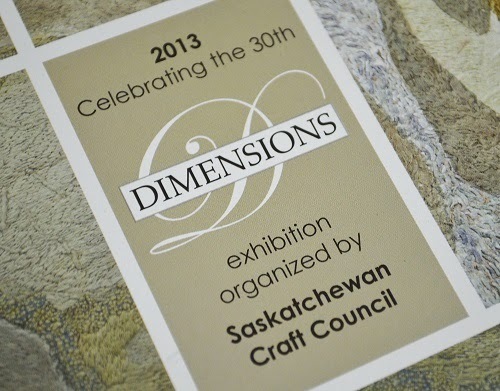 I also headed to the SK Craft Council to renew my membership and was WOOHOO! surprised to see that Dimensions is already up! I really like where my piece is placed. I nearly cried. I was so embarrassed I had to get out quick. lol I still can't believe my embroidery is part of it. The reception is at the end of the show, in January 2014. I headed across the road to Handmade House to see Terry Lindsay's paintings that are currently featured there and fell in love with nearly every hand crafted item in the place. I am blown away by people's crafts. I find that I'm developing a real soft spot for other people's fibre art. So, to add to my handwoven mobius shawl (WHICH I WILL LOVE FOREVER thank you Alison Philips), I now have this lovely charm floating and spinning in my sewing room. Her name is Judith. She is literally swinging from my chandelier. 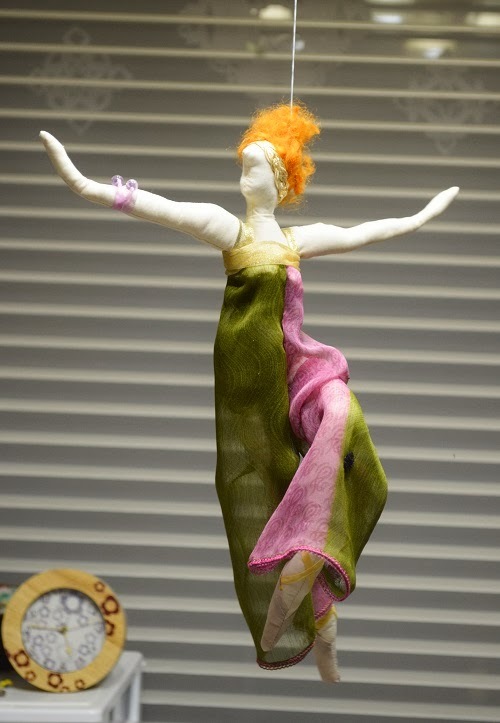 She is fantastic to watch as she slowly twirls her magic in my studio. So there it is... a very happy Sunday. I'm off to 'Little Gems' today to volunteer from noon to 4ish, then off to yet another art show & sale. Enjoy your weekend! I am SO excited that you and Alison's mobius shawl found each other! It was one of my absolute favorites from the sale and it will look amazing on you! It's really great to connect! I'm putting your blog on my blogroll now so I don't miss anything! What a fun Sunday! So much going on! I think it's lovely that you could take your daughter and her crafts. Her sheep and goddess eyes are sweet. I felt the same way about dolls, but love the one you bought. She's magical.